Zorse 'Eclyse', a zebra-horse hybrid foal is pictured in the Safari park in Holte-Stukenbrock near the western German city of Bielefeld June 27, 2007. One-year-old Eclyse was accidentally produced when her mother a zebra, was taken from her German safari park home to a ranch in Italy for a brief time. Ecylse who was born in Italy, has stripes on her head and rear, while the body and her legs are white. How would you photoshop that pic?? And why is that always the answer to everything?? btw google Zorse if you’d like more info on these crosses…they’re not really an ideal mix to have. And it is VERY easy to photoshop something like that. Very easy. I can easily photoshop something like that! Don’t ask how it can be done. People just spend their time on things like this. 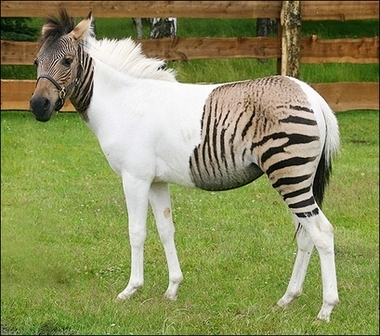 i saw this zorse on animal planet…it’s real. stop being stupid. Adorei!ficou tipo uma raça de cavalo com zebra!IIIIIIIIIIIII acho q deu zebracavalo! Photoshop is the answer to everything we see online because you shouldn’t always believe your eyes. Photoshop is a very powerful program. Be nice. God what’s everyone’s problem? Photoshopping is powerful…but it’s not going to be able to go up against people who have actually gone to see it…so..yeah. it’s real. and if you think someone was actually pathetic enough to spend the time photoshopping a VIDEO clip, then you ARE stupid. oh yeah..go to youtube and put in the name to watch a video of it..then try to tell me how someone could make it up. Their genetics are a lot like mules so they are sterile. Mules are very popular though so as long as there are horses and zebras available there can be zorses. They are very flighty and unpredictable from everything that I know so they wouldn’t be for everyone! that really does look photoshopped, the lines are a bit too clear..
this totally looks like photo shop. holy crap people..there are videos of this thing and people who have SEEN it in person. Stop being so dense and saying it was photoshopped. you can’t reallt have one because it’s just like keeping a wild animal so you could get kicked. wow God gave us a new creation but soon their might be more so be ready but be careful it was obviously put here for a reason. thankyou God for a beautiful creation. Upper left half a Russian chick and the right half a Chinese ..
That would be a real fun.. It is not photoshopped.I mean, people can’t just photoshop a video. YES IT’S REAL. I’ve seen one. Actually guys, there’s a very real chance this ISN’T photoshopped, as much as it may look like it. If the horse the zebra was bred to was homozygous for the colour gene, which produces large spots in horses, it’s guaranteed that this is exactly what would happen. That is why the area with the stripes is a different colour cream than the rest (probably retaining whatever colour the horse’s spots were), as well as why the stripes are localized to certain areas. Check out a page on horse genetics if you don’t believe it. I hate you people so much! I took that picture! its real ok! He’s better looking on the other side of him. Zebra hybrids are very caustic creatures. It is advised that only those with training in how to care for the wild zebras should keep them. It’s like the wolf dog, sounds cool, looks cool, but is very dangerous. they are even worse than the wild animal because they are unpredictable. Please, don’t try to get one. it is my opinion that such animals should be under the law as if they were wild animals. Just some fun facts: Zebra hybrids are rare. They can only be produced from a natural mating. typically the male has to be the zebra. It has been done with a female zebra a few times but in all cases the foal didn’t make it to adulthood. This leads scientist to believe that for the embryo to be viable the smaller number of chromosomes must be on the male side of things. Zebras have from 32 to 46 chromosomes while a horse has 64 and donkeys 62, most mixes in up in the middle around 54. They are hard to mate because the female will kick at the male before allowing him to mount. Although horses do this too they are not nearly as rough as zebras and it hard to get a male horse to accept it. That’s an awesome zebra horse cross, it looks so cool! Does it’s mane grow out like a horse? Does it have a tail like a Zebra or a horse? Very cute! My kids loved it!